Tarifa sits at the Southernmost tip of Spain, where the Mediterranean sea meets the Atlantic ocean. It smiles at Morocco across the Gibraltar Straight which splits Europe from North Africa. 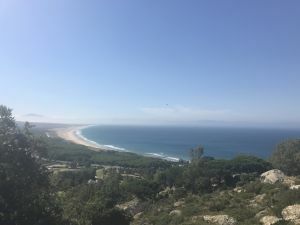 With its long sandy beaches and rolling countryside Tarifa is an adventurer’s paradise with plentiful opportunities to have fun in and out of the water. The town of Tarifa is a quaint fishing port with narrow cobbled streets. 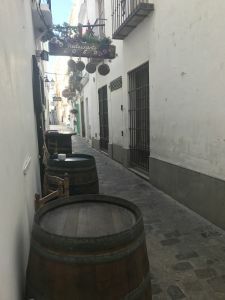 Tumbling jasmine and beautiful wrought-iron rejas make Tarifa old town a charming place for a stroll and a great place to stumble into one of its many Tapas bars for a delicious bite to eat. 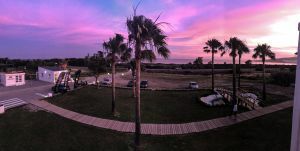 The ‘new town’ in Tarifa adds a different element to this laid back fishing town with is rows of surf shops, bike rental places and an international vibe. 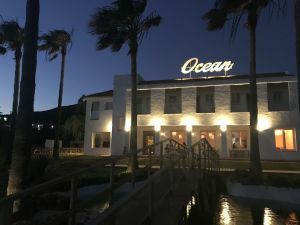 For our trip we stayed at the Ocean Nature Lodge about 6km from Tarifa town. The hotel sits back from the road with views over the beach and mountains. Stepping into the main hotel building it had a fresh, laid back vibe and we felt instantly at home. The hotel had a restaurant which served breakfast, lunch and dinner. A bar which was open all day serving hot and cold drinks, the fresh orange juice was my favourite. During our stay Martyn and I spent time drinking and playing games on the veranda at the front of the hotel overlooking the sea. The hotel complex included self-contained ‘bungalows’ which looked like great places for groups of friends or couples wanting more privacy. 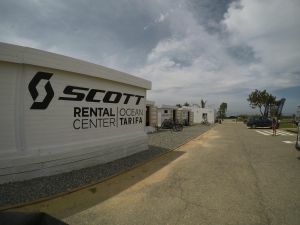 There was also a nice pool, gym (which wasn’t open when we were there), on site bike hire with Scott Bikes and kite school making it easy to rent gear or have lessons. The staff where so helpful, they made us feel like friends rather than guests, and they were very patient as we practised our broken Spanish each day. Our room overlooked the sea. On more than one occasion I found myself sitting on the bed staring out at the palms blowing in the gusty wind and watching the colourful kites dance on the water below. The room followed the chilled out beach vibe with open wardrobe, roller door and white washed wood a plenty. The room was a reasonable size with a balcony, nice comfy double bed and amazing waterfall shower in the wet room. Breakfast was not included in our room price and cost 12 euros a day but was well worth it. A fresh selection of pastries, croissants, hams, cheeses and fruit. You could also have cooked eggs with bacon or omelettes cooked to order each morning. This was a nutritious way to start an action packed day exploring the nature reserves or playing on the water. Lunch was simple but delicious; with a small menu selection of salad, sandwiches and mini burgers all the food was well cooked and prepared to a high standard. Evening meals were a real treat. The menu was small but the choices were cooked to perfection. 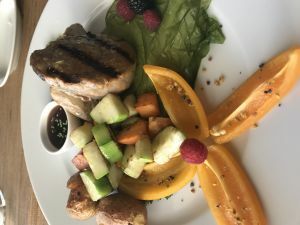 I had the tuna, caught using the Almadraba method a style of fishing using a circle of boats and nets, a practice which has not changed since the Phoenician times, over 2000 years ago. It was cooked pink and served with an variety of vegetables and new potatoes, as requested by me. Martyn had the pork cheeks which were melt-in-your mouth tender and came with a butternut squash and greens. Puddings were also incredible my favourite was a melting ball of cocoa which uncovered a rich chocolate, orange and nut cake with a rich dark chocolate sauce and candied fruits it was the perfect end to any meal. 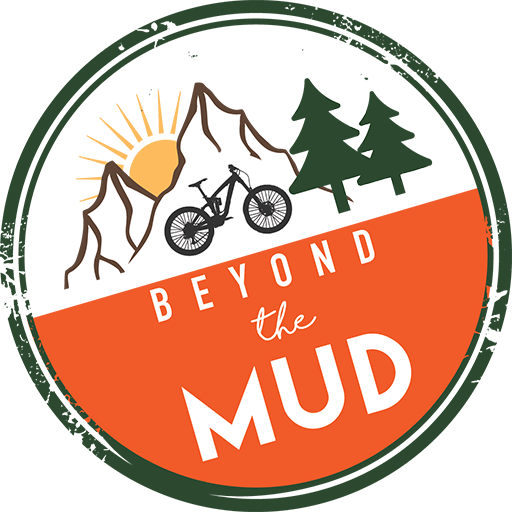 Ocean lodge is a Scott bike test centre with a fleet of bikes including, road, mountain and e-bikes to try out in the stunning countryside. 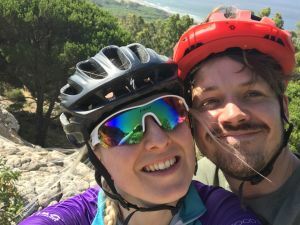 We chose to hire Scott Spark mountain bikes which were super light and great fun! Our ride started early to avoid the mid-day sun. The ride started, as every good mountain bike ride should, with a climb. We traversed the side of the hill until we reached the top, the winding gravel surface kicked up dust in the balmy heat of the morning and we were soon stopping to admire the view and catch our breath. 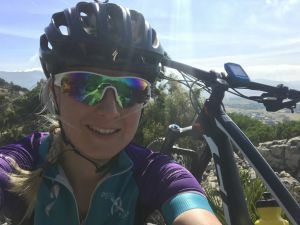 We had hired a guide to explore the 600 kilometre National Park, which turned out to be a sensible idea as off-road it was a rabbit warren of trails and paths and knowing where the best single track was required local knowledge. The advantage with going high was being able to make the most of the stunning views out across the Atlantic with Morocco a hazy shadow in the background. 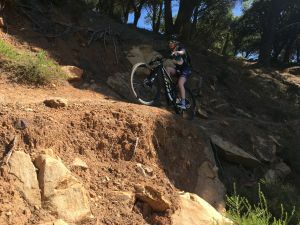 Our route was around 25km in total and the perfect way to enjoy the single track Tarifa has to offer. I would love to go back and do more biking soon. I had lessons with Kite Force Kiteschool who are linked to the hotel. 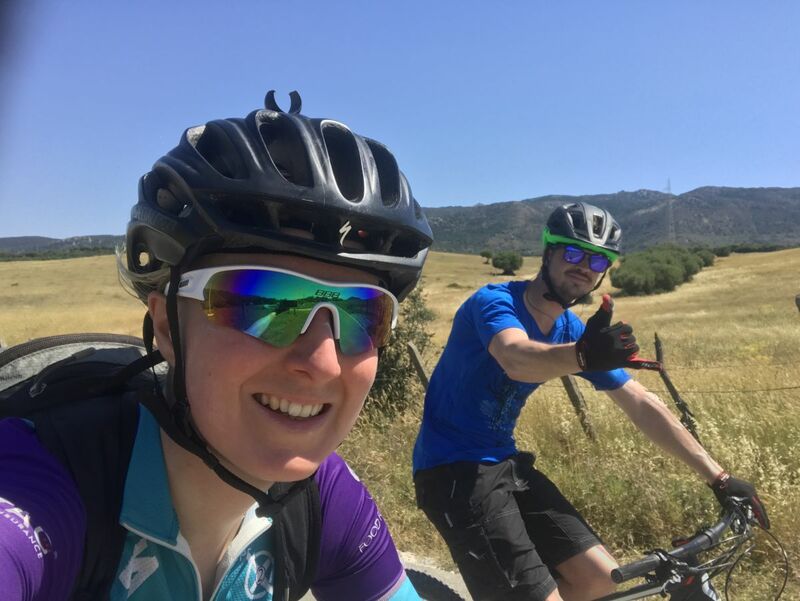 It was super easy to book my lessons via email and on arrival we worked out the ideal times due to wind and conditions. A friendly instructor met me at the hotel and took me to the beach for each lesson. 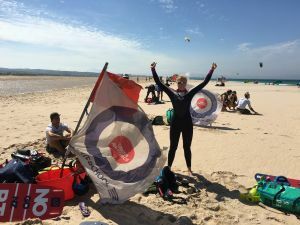 To read about my kite surfing lessons click here. Touching down in Gibraltar I didn’t realise how much hard work and fun the next four days would be! Never liking to admit defeat, when Martyn suggested I take lessons again, it didn’t take much for me to sign up. 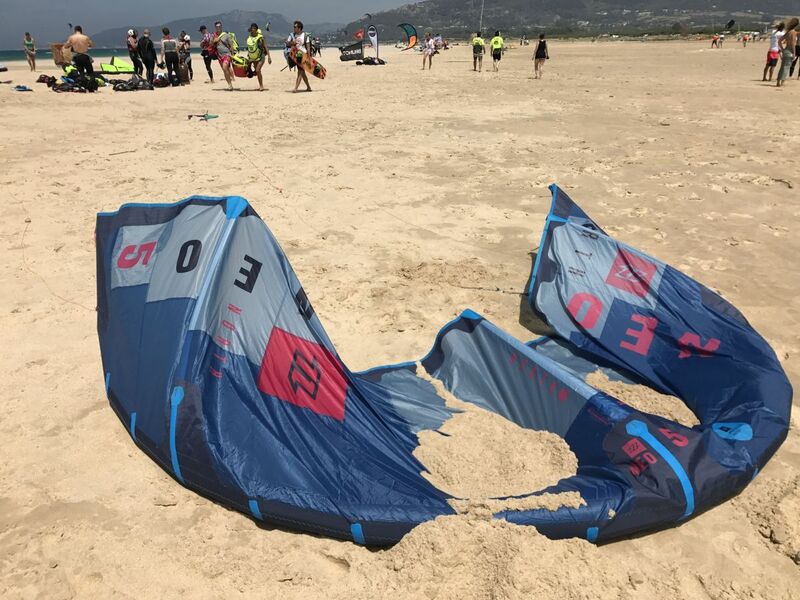 This time, with help from the Levante, an easterly wind that blows across the mountains of Tarifa and funnels into Gibraltar straight creating gusty strong winds. Arriving at the beach with Morocco as the back drop the beach colourful kites danced in the sky, many with newbies, like myself, struggling to keep control in the gusty conditions. Day two was about mastering the body drag this is a key technique to master both up (against) wind and down (with) wind in case you lose your board. The Atlantic was surprisingly warm as I bobbed down in the water and with a slow motion moved the kite to 10 it instantly pulled me forwards and I shot off with the wind down the beach after a short while I moved the kite back to 12 and then over to 2, this time I pulled on the bar a little too hard and shot off in the air, face planting and taking a great gulp of ocean. Reaching the shore I was surprised how difficult I had found it, not only the physical demands on trying to swim against the current whilst holding the kite still in the window and trying not to swallow too much water made for an interesting challenge. Kitesurfing is a tough sport, there is a lot going on all at once so brain power and muscle power are both working over drive. I am going to keep up my lessons in the UK. Good core strength will be an advantage – pilates!